When I was a kid, my big sister and I didn't get along. I mean, AT ALL. To the extent that it's kind of a miracle that we both reached adulthood. We had a lot in common, but for some reason we chose to ignore that. Neither of us wanted to be ANYTHING like the other one. My sister was musical, smart (better grades than me) and computer-savvy. I was loud, boy crazy, and into depressing poetry. My poor sister got the "honor" (read-incredibly miserable task) of chaperoning me on a few dates. Needless to say, this was another point of contention in our already-strained relationship. We're pretty close in age, only 23 months apart. She had much more interest in going to college and making a career for herself than chasing after boys, something I scoffed at then. Of course, I know how stupid I was now, but hey, we all learn as we grow, right? When I was a teenager, I remember having some kind of stupid argument with my sister. I was complaining to my Nana about her, how she didn't understand me at all. My Nana just smiled at me, and told me about the time when she and her sister were young. They'd get into fights, scream at one another. My great-aunt Maddy would sit on my Nana's back and pull her hair as hard as she could. They hated one another, so much that it seemed impossible that they'd let each other survive until adulthood. Until they grew up. And then? Somehow they became best friends. And my Nana swore that my sister and I would have the same thing happen to us. I laughed at it then. MY sister? No way. She'd never like me, and the feeling was quite mutual, thank you very much. But then, know what? Something weird happened. She grew up. And I wasn't far behind. And somehow, we found ourselves spending more time together. On purpose, even. Without being forced to. And then we started going to one another for advice. A shoulder to cry on. Sending lols, and sharing movies, and generally behaving civilly, to the point of actual friendship. More than friendship. Best friendship. I'm just telling you this story because my sister means a lot to me. Without her, I don't know that I'd do. 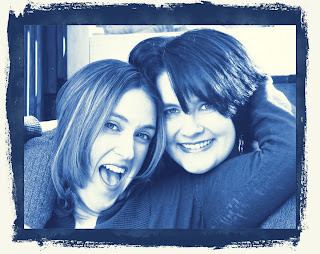 She's truly my best mate, one of my bestest beta readers, and I love her dearly. Oh, yes! My sister is a little more than 4 years younger than I am, but she was 5 grade years behind me in school. And SHE stole my Playtex Living Girdle (I know it dates me) so she could wear MY tight skirt to school in the 7th grade. When she heard me coming home she promptly hid in the closet and cut my girdle (which I'd worked hard to earn the money to buy) off her body with pinking shears! Surprisingly, we did grow up and our relationship goes beyond best friends...we're like twins these days. I dedicated my newest book to her! Makes wish I had a sister! Brothers are good, but not the same. I can totally relate. My sister is a little less than 3 years older than me, and my brother a little more than 2 years younger than me. I, being the middle child, fought with both of them (I mean downright fist-fights at times). Now, I get along great with both of them. We are all close, my sister & I especially since I helped her a lot with her kids when they were growing up. My brother an I were really close, and I was devastated when we lost him. He was my 'bodyguard' against my sister, who would have killed me if she'd had her way. They're both gone now, so I tell everyone to give their family members love and hugs while you can. Middle kids FTW! I was the baby for 8 long years until brother showed up to usurp my position. We should compare battle scars. I have one on each arm from each sib! I'm so sorry for your loss. I hope everyone takes your advice to heart! I know I will. Life is so unpredictable. But good memories are the best comfort. Hugs!! My sister and I are the same. We fought like cats when we were young, and now we're great friends. I have brothers although I was raised as an only child. I am fortunate to have found a friend in high school who is still my best friend and I am sure I drive her more nuts than her real sister but she is the sister of my heart. My stepdaughters are about 18 months apart and constantly fighting so I am now observing the phenomenon.